On Tuesday I had a lovely day at Harewood House with my WI, we had a private tour of the Victoria exhibition, so we were looking round for an hour before the house opened to the public. Harewood is a stately home just a few miles from us, it was built in the 18th century and it’s the ancestral home of the Earl of Harewood and his family. They have strong links with the royal family, the current Earl’s father was the Queen’s cousin and Queen Victoria also at times stayed at Harewood. There was a recent dramatization of the life of Victoria on the BBC, I have to admit I missed it as I don’t particularly watch any TV, but I gather it was excellent. Harewood House was used in the filming for the inside of Buckingham Palace so they now have an exhibition about Victoria, including many of the costumes used in the programme. Our tour was fascinating, our guide told us all about the filming, which rooms were used, who wore what, but also tied it in to the changes that were made to the house during the Victorian period together with extra artifacts from Victoria such as her sketchbooks. The costumes were stunning, they were made by a theatrical costumier down in London and they were beautifully made, I loved all the extra little details like decorative buttons and tucks. 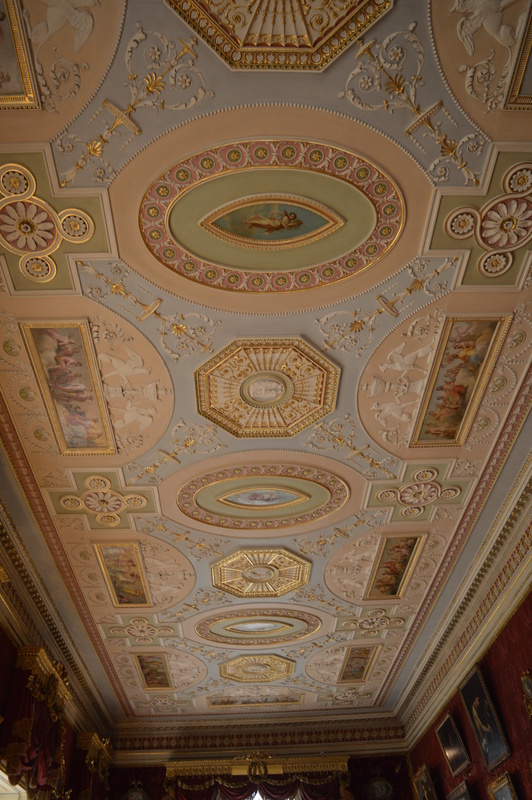 I’d forgotten just how beautiful Harewood House is, the original interior was designed by Robert Adam and the ceilings are absolutely stunning, many would have had a carpet designed to match too. Much of the furniture is by Chippendale (who was a local craftsman) one interesting point I learned was that the festooned pelmets in the gallery are actually carved from wood and painted to look like velvet! You can just see one at the bottom of the photo. At Harewood you can also visit ‘below stairs’ which I think is the most interesting bit, seeing the kitchens with all the ranges and the huge collection of copperpans and jelly moulds. The grounds around the house were designed by Capability Brown, it is very much parkland, rather than garden, but it’s very pleasant to meander round and they’ve also made a Himalyan garden, full of rhodedendrons, acers, magnolias, it looked lovely, though the gardener we were chatting to said it will be stunning in about two weeks time when all the candelabra primulas come out…typical! Harewood estate was also the base for the reintroduction of the Red Kite, it’s been hugely successful, we regularly see them wheeling about the skies above our house, though I wasn’t so keen when one flew low and dropped his dinner on our conservatory roof, it was a rather manky rabbit leg!! I managed to get a couple of good photos whilst we were at Harewood as they were flying fairly low. They are magnificent birds, I love seeing them around. This entry was posted in Serendipity and tagged Harewood House, Victoria. Bookmark the permalink. My goodness, how magnificent everything is about this house…as you said, it’s stunning!! Those costumes are amazing…the fabrics are beautiful but the little details on the garments are just wonderful! 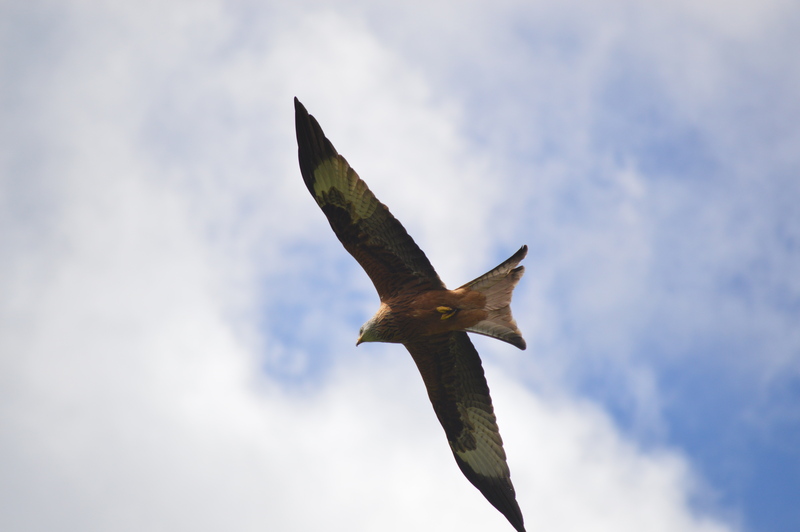 Those dresses were a sight, as was the rest of the house, but I think I was most intrigued by the red kite…how cool to capture one soaring! I grew up not too far from Harewood House, although I have no recollection of ever visiting the interior. We used to cycle down Harrogate Road to Harewood and then back home via either Eccup Lane or Eccup reservoir. I’m pretty sure we weren’t supposed to cycle along the road by the reservoir and we had to lift our bikes over the gates at either end! I can’t imagine cycling down the A61 now! They used to hold traction engine rallies at the house and we used to go to those… 35 or 40 years ago. Wow–this looks like an amazing site to visit! So much to see! Stunning, opulent splendour and so beautifully preserved and available for learning. looks like you had a lovely visit. Mind you, I’m glad I didn’t live in that day & age . . . fancy having to wear dresses like that, and can you imagine the time it must take to keep those copper pots shining?